Citation Information: J Clin Invest. 2018;128(8):3319-3332. https://doi.org/10.1172/JCI98194. CNS-specific deletion of Sec24c leads to microcephaly. (A) Representative photographs of control and Sec24cNes-cKO mice at P0. 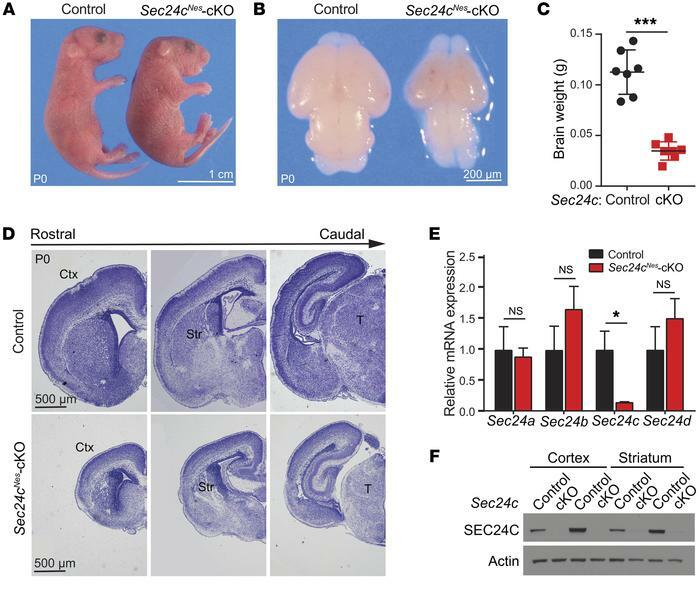 (B) Representative images of dissected brains from control and Sec24cNes-cKO mice. (C) Brain weights (mean ± SEM) of Sec24cNes-cKO mice (n = 7) and control mice (n = 7) at P0. (D) Nissl staining of brain sections along the rostrocaudal axis in control and Sec24cNes-cKO mice at P0. (E) Sec24a, Sec24b, Sec24c, and Sec24d mRNA levels (mean ± SEM) in the cortices of Sec24cNes-cKO (n = 5) and control (n = 5) mice. (F) Immunoblot analyses of cortical and striatal extracts confirming the loss of SEC24C protein in Sec24cNes-cKO mice. n = 2 for each genotype. Scale bars: 1 cm (A), 200 μm (B), and 500 μm (D). cKO, conditional knockout; Ctx, cortex; Str, striatum; T, thalamus. *P < 0.05 and ***P < 0.001, by Student’s t test.